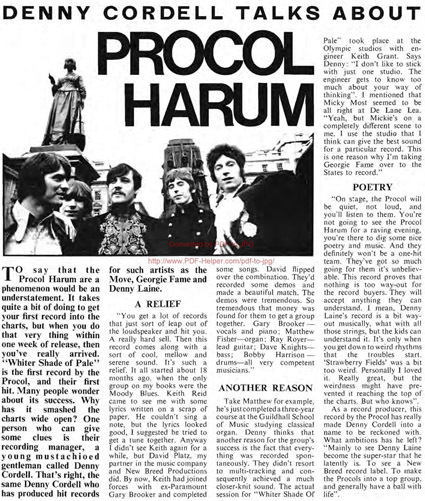 To say that the Procol Harum are a phenomenon would be an understatement. It takes quite a bit of doing to get your first record into the charts, but when you do that very thing within one week of release, then you’ve really arrived. Whiter Shade of Pale is the first record by the Procol, and their first hit. Many people wonder about its success. Why has it smashed the charts wide open ? One person who can give some clues is their recording manager, a young moustachioed gentleman called Denny Cordell. That’s right, the same Denny Cordell who has produced hit records for such artists as the Move, Georgie Fame and Denny Laine.